After my happy reaction to Episode 4, I am now back to Episode 5 because I can’t understand some of the contents. Before that, a brief info on some Malaysian slang/words used in this episode that is worth noting. No not Leceh which is said twice in every episode. All Malay language. What I don’t like is this series may be giving a wrong impression that Chinese community in Malaysia are like those in Indonesia. So very errr.. Malay. The only thing that shows we are different is Ruco’s 2nd favourite verse, SOLLI. Yes have to pronounce So-li because it is actually Sorry. Whilst we do say Police in English, a thought a nice touch would be saying mata aka ma-ta which is police. Ruco also had to speak a few lines of Malay tonight. I may have complained his one word Malay may be terrible or not accurate and suddenly I am singing praises when he said a full paragraph or even 2 full paragraphs. It is simple really; easy to note mistake in 1 word which is also as easy it is to perfect the 1 word but a full sentence where he made an effort to actually speak the language and I could understand him? Deserve some applause even if have mistakes because it is not easy. Ok, recap. My emoticon above is that way because of something I shall explain later. Still in Penang, tour group enjoying their time and all. Ruco tries hard to explain to Sik Sik he is not the same as Nic. Sik Sik tries very hard to pretend he does not exist. Suddenly I see a huge golden statue and a long tall stairs and I was like isn’t that Batu Caves(http://en.wikipedia.org/wiki/Batu_Caves)? And where is Batu Caves? The sacred place for all Hindus, supremely important place during huge Indian festival called Thaipusam and in Kuala Lumpur, like I said, about 3 hours drive from Penang. Let’s just forget about that. Sik Sik overheard Ruco boasting to a female in the group that he could run up more than 200 steps in 2 minutes. Someone hands over a phone to Sik Sik and it is Ruco’s and she hides it and Ruco looks for his phone, couldn’t find it, and she says perhaps the phone is left up there and off he ran, all the 200 plus steps, huffing, puffing only to have Sik Sik laugh and taunt him that didn’t he just said he can run all the way up under 2 minutes? It was more than that. Poor guy almost dropped from exertion. Later some conflict with the manager of Lassie hotel, Mr Sky who hates Sik Sik and some argument and Sik Sik fights back, in words, not in punches. Point is to show how brave and forthright Sik Sik is, how bullied poor Vivian (here she is Yvonne) is and all the more intriguing why Sky seems to behave quite different with Ruco. Till now no explanation. Anyway more drama later when a very bad gwaipo actress acting as a woman who lost her ring and 3 guests (the 3 playful young men in the group) are all accused of stealing her ring by the manager. Now that is just idiotic. No manager will do that and be so hostile IN THE LOBBY. Anyway ring is found and Sik Sik demands he upgrades their buffet to high class buffer and also apologise. Yvonne looks quite happy with the results. Meanwhile Ruco still tries hard to win Sik Sik’s trust for god knows why. He tries hard to convince Sik Sik to look for the white knight, like isn’t she curious who he is? At night she fantasizes about this White Knight, remembering his blurry shape fighting 4 men and the shape still blurry when the face becomes very clear and who she sees? MOSES CHAN!! That was one genuinely funny moment even if an obvious jab in a funny way at by then soon to be Mrs Moses Chan herself. Funny. Anyway Ruco at breakfast or lunch tells her he found her guy through a policeman friend called Don or someone who can find someone who ended up is Don, I can’t remember who could help to find that white knight and she can meet Don when they’re at KLCC (sigh…. this is getting out of hand). So she trusts him once more, is seen at Pavilion (in KL) and on her way to KLCC/Petronas Twin Towers (http://www.petronastwintowers.com.my/)(in KL) and on the way decides to buy new clothes, bag and shoes to meet this Don whom she believes might be her white knight and Ruco stalking her. And so at KLCC, standing at a position to highlight the beautiful waterfall and Ruco appears in white and she is pissed off and calls Don and it is Ruco and he explains he’s the white knight. Smiling satisfyingly, her reaction is not positive. She becomes angry and shouts “Do you think I am easy to bully? Am I that easy for you to lie to, to cheat, to play around with, to push around? Do I look like that sort of weakling? !” and basically she storms off as Ruco tries very hard to explain that he is genuine and she could ask Tom (the guy she met again in episode 4). Next thing back in Lassie Hotel (in Penang). 1. why does she treat him that way when he was telling the truth? My answer is because he did lie to her in the past and she is angry with men in general and more so Ruco had 2 women fighting over him, slapping her and so she sees Nic in Ruco and so pours all her anger to Ruco when she should have slapped Nic herself instead of avoiding him. Terribly unfair to Ruco. But the better question is ..
2. Why is Ruco so keen on getting her trust? Why is he trying so damn hard to win a good impression? My answer is to create tension and then later misunderstanding and then discovery and then understanding and then love. Frankly I am not sure why he is so crazy about Sik Sik. Sik Sik is not an extremely impressive person, to me her personality is nice and persistent and brave but whatever Ruco is doing now is beyond just admiring her. He acts as if he is in love with her, trying to win her trust meaning her love meaning her affection. I find it exceedingly predictable and boring and since I don’t see the charm in Sik Sik thanks to in part Aimee’s bland interpretation, I find myself liking Ruco (as 6th Son, not the actor himself) less and less for being so eager like a puppy following his master. Another problem is the seriously ridiculous and even misleading geographical error. Ordinarily it should be ok but the thing is this series obviously promotes Penang. Penang is the main point and focus. People who doesn’t know Malaysia may thing Penang has cosmopolitan place like Pavilion, that the Twin Towers is in Penang and Batu Caves is in Penang apart from genuine Penang local attractions. It is very very misleading and I find it such a lazy tourism promotion if this is one. By just mixing these places up, I feel this series is more intent on showing most attractive places for their scenery rather than actually genuinely promoting the local attractions; much like casting pretty people in a series rather than the talented ones. Very misleading. I also find it extremely misleading with Ruco sprouting Malay words here and there, making it sound like we are kinda like Indonesia. It would be wonderful if he has mixed Malay with Cantonese with Mandarin with English and with Hokkien which is what most Penangnites speak. Full sentences in Malay gives me an impression perhaps Luk Kung Chi may be a malay guy or grew up in Malay community rather than this being Malaysia which is multi national. At least in this episode I can hear the words fried kuey teow and cendol. Something new. But the fact that this series lack geographical integrity makes it very insincere. Worst is tonight we see Batu Caves, we see KLCC, major tourist spots in KL and the ending brief introduction is on Penang Airport. Doesn’t this show this series is making Penang the starting point? Hence the misleading content. I forgot what. Oh yeah going home to HK time. Before that Yvonne becomes friends with Sik Sik and Yvonne is such a good woman who admits she too is disappointed with Nic. She likes Sik Sik and offers Sik Sik a job at the Lassie Hotel which she says she will think about it but of course she will accept later to avoid Nic. Very predictable. In HK. To be brief, Sik Sik is offered the manager position in new Tuen Mun office and she is excited but Nic is bothering her again and again. Instead of dealing it herself, she asks first her sister to return her ring and then Chin Jun to play basketball with her as Nic waits for her at their meeting place. They chat for a while when suddenly Sik Sik says to Chin Jun why don’t they date…. Last scene is a short intro on Penang airport. Last 30 minutes or so and I summarised to 4 lines. Other things happened but they’re not relevant. Sik Sik’s story is also at this point pretty stagnant for me. Story wise, ok, some good stuff which is funny stuff to poor Ruco (especially the running up Batu Caves stairs scene – did Ruco do it? If yes, how many takes?) but I did not like how he is too eager to please her. I am not pleased of her treatment of Ruco. I am bored with the side stories. I in fact finds Vivien Yeo’s story more intriguing. And Tony Hung needs some sleep. He looks dead tired. And the manager accusing theft in the lobby is really out of this world. Malaysian hotels may not be friendly, etc but surely a 5 star hotel in Malaysia knows how to deal with urgent matters tactfully. How much misconception, insults, geographical error and the likes must this series hurl at Malaysia before things are done the right way? No comment on performance tonight because the same comments apply except Vivien Yeo plays her part very elegantly. I can understand why they have the Chinese girl speak Malay to Ruco in the room, even though there is now a debate that Malaysian Chinese don;t speak Malay to each other. It is not about her, it is about him. They probably wanted Ruco to be seen as a true Malaysian, who can speak multi languages, from Cantonese, Malay and Mandarin. He hasn’t tried Hokkien and English yet though. As for her speaking Malay, that hits a sensitive part of Malaysian Chinese psyche. If she is seen as wanting to be portrayed as a Malay (as in Malay race), it is also not very nice, as Malay nowadays are so conservatively dressed with headscaft and all, and the ‘wild’ possessive nature of her won’t go down well to them. So, all in, definitely a miscast. There is a slight confusion here. He may have called her pretty or he may have said he had bad luck. I can’t remember the entire sentence which uses that word though. Too lazy to backtrack. yup, agree with Funn that this series is really giving a wrong impression about the Chinese community in Malaysia … it seem to be portraying indonesian chinese more than malaysian chinese, especially the language of communication “bahasa (malay language)” … but the same occurred in “Divas in Distress” when Mimi Chu communicate with her personal assistant … just to clarify, as mentioned by many other malaysians in this review, primarily chinese in malaysia communicate with each other in either mandarin, cantonese, hokkien, other dialects or english … we rarely speak bahasa (malay language), unless communicating with other ethnic groups and official matters. another misconception is about malaysians, the show seems to portray malaysians as unfriendly and rude… especially when the show is suppose to be set in Penang … im from Kuala Lumpur but when i visited Penang, the people there are really very friendly and helpful … the penang airport is not that busy until there are people who run pass you knocking down your luggage without stopping to say sorry … the bus drivers in Penang are also very efficient and they can speak English … the Nyonya restaurant portrayed in the show also does not seem to promote Malaysia in a positive way, it sounds like it is serving unauthentic traditional food and serving ready mix curry powder with an unfriendly boss that it is a cheat … well okay, food that is not traditional is common but please dont portray the boss like he is a cheat … or maybe they should have written the script in such a way that they went to an authentic nyonya restaurant enjoying tasty curry, lobak and cendol, afterall it is suppose to promote Malaysia. agree with Funn that the geographical misconception is quite misleading … the show seems to portray that Penang to Kuala Lumpur is only a car drive away to a nearby area, such as going to your neighbouring supermarket or pub … well in actual fact, Penang to Kuala Lumpur takes 4 to 6 hours to drive by car … it takes 45 minutes by airplane, but you will still need to travel to the airport by bus or taxi and wait for check-in which will take another 3 hours … these guys in the show travel by plane all the time? they must be super rich, but ruco’s character doesnt seem so since he drives an old junk car … btw, the “I Love Penang” t-shirt on the passenger seat of Ruco’s car makes it looks very typically Malaysian, haha =D (malaysian love to wrap the car seat with t-shirt when the cushion starts to spoil and tear) … well okay, can understand that the scripwriter is trying very hard to incorporate the tourist destinations of Malaysia with the storyline … so maybe we can ignore the geographical misconception =P … afterall, Hollywood also once put KLCC Twin Towers and Malacca River as one location and created a big hoo-haa in the local news. You do recognize that Malay is also recognized in Indonesia and most of Southeast Asia, not just good old Malaysia. there’s also the Phillipines context and the Malaysia context as well. Bubblez, you are off track. It is not a complaint about usage of different Malay, it is about Malaysian Chinese not speaking Malay to another Chinese as a norm. Do you get the context? You actually dont. looking at your comment. “Bubblez, you are off track. It is not a complaint about usage of different Malay, it is about Malaysian Chinese not speaking Malay to another Chinese as a norm. ^ There is a nicer way of saying this… Thanks though. However, my comment was gearing towards “it seem to be portraying indonesian chinese more than malaysian chinese”. Yes, it is a misconception to the Malaysian Chinese community, but the language Malay isn’t just used in Malaysia, it’s also used in different parts of Southeast Asia, also calling it “Malay”. Hence, it would be very easy for TVB to mix up the two (eg. using Indonesian Chinese perspective instead of using Malaysian Chinese). I am not talking about language used. I am talking about the frequency it is used. My comments weren’t geared to your episode thoughts, Funn. I was referring to anneyen’s comment, which is above about portraying the Indonesian Chinese over Malaysian Chinese. Nobody speaks Malay in SE Asia, except Malaysia, Indonesia and Brunei. Not Philippines, not Papua New Guinea, not Thailand. And the Indonesians don’t call their language Malay, they call it Indonesian. And they are different in connotation and vocab. Please don’t mixed up. Philippines will be offended if you refer to them as Malay. They are not, and they speak Tagalog and are Christians, not Muslims. Indonesians Chinese have been so entrenched into the local culture that they speak nothing but indonesian, they can’t understand Chinese and they watch TVB dramas, if they do watch at all, in Indonesian. And to confuse Indonesian with Malaysia Malay is off track because they are different. rebutt, and albeit not in “There is a nicer way of saying this”, because what you say is not nice. I am/was not trying to sound like some expert. I was only trying to figure out why TVB portrayed the Malaysian Chinese wrong. If I mixed the two up, then it just shows how easy an outsider/foreigner can mix the two up. I know that the official language in Indonesia is Indonesia. As for the Philippines and Malaysia context, I was reading it from #Philippine_context" rel="nofollow">http://en.wikipedia.org/wiki/Malay_race #Philippine_context, which is a misconception. Not saying that Philippines speak Malay! Malay is spoken in Malaysia, Indonesia, Singapore, parts of Thailand, and Brunei. Indonesia and Brunei have their own standards, Malaysia and Singapore use the same standard. You could have said it like, “Bubblez, I think you misinterpreted it wrong because Funn was talking about Malaysian Chinese not speaking Malay to another Chinese as a norm.” instead of ““Bubblez, you are off track. It is not a complaint about usage of different Malay, it is about Malaysian Chinese not speaking Malay to another Chinese as a norm. Do you get the context? You actually dont. looking at your comment.”” The tones between these two sentences are quite different. hi @Bubblez … what i was trying to explain is that Malaysian Chinese do not communicate with another Malaysian Chinese in Malay (Bahasa Malaysia) … we usually communicate with each other in either mandarin, cantonese, english or other dialects. in most tvb dramas, they portrait that Malaysian Chinese communicate with another Malaysian Chinese in Malay (Bahasa Malaysia) … this is not how we communicate, we usually speak among Chinese either in mandarin, cantonese, english or other dialects … we only speak Malay (Bahasa Malaysia) when we communicate with other ethnic groups, for schooling an for official matters. In olden times, Baba & Nyonya communicate in a mix of Malay (Bahasa Melayu) & Hokkien but their grammar is in the opposite formation as compared to standard Bahasa Malaysia … for example curry chicken is in proper Malay (Bahasa Malaysia) is “kari ayam” … but in Baba & Nyonya language it is “ayam kari” … they also have many Hokkien vocabularies in their language … however, most Baba & Nyonya nowadays in Malaysia speak English at home while Baba & Nyonya in Singapore speak mandarin. that is why Funn mentioned in one of the reviews that the girls communicating in Malay (Bahasa Malaysia) are most probably suppose to portray Baba & Nyonya … but the actresses are not speaking proper Malay … many Malaysian Chinese cannot speak Malay (Bahasa Malaysia) properly because of heavy Chinese ascent. Baba & Nyonya (Peranakan Chinese in Malaysia) mainly stay in the states that are classified as Straits Settlement during British time which is Penang, Malacca & Singapore … they are different from other Chinese in Malaysia …. Malaysian Chinese is not Baba & Nyonya, the two groups have different cultures but nowadays everyone is assimilated. Baba & Nyonya are Chinese that came to Malaysia during the Ming Dynasty of China, they have a unique culture of mix Malay & Chinese cultures … that is why their cooking, art, poetry and music are different … they maintain more Chinese cultures such as prayers and rituals … their culture is also more Ming Dynasty orientated. however, not all Chinese who came to Malaysia during the Ming Dynasty are Baba & Nyonya, there are also Chinese from that era who still maintain full Chinese culture until today and are Malaysian Chinese … also there are Muslims Chinese from that era who are now assimilated with the Malay ethnic group … descendants from this era are approximately the 5th or 7th generation Chinese in Malaysia. most Malaysian Chinese came to Malaysia during the end of Qing Dynasty and during the Republican era … they are about the 2nd or 3rd generation Chinese in Malaysia … this group of Chinese form majority of the Chinese population in Malaysia … usually their culture is based on Southern China culture such as Hokkien, Hakka, Cantonese, Hainan, Teochew, Guangxi etc … so that is why majority of the Malaysian Chinese population in Malaysia do not communicate in Malay (Bahasa Malaysia) … usually the language of communication is cantonese, mandarin, hokkien, hakka and other dialect. due to the British colonization of Malaya … the Malaysian Chinese community is further separated into British culture and Chinese culture like in Hong Kong, as portrayed in the tvb drama “Silver Spoon Sterling Shackle” whereby Arthur Chung and family are considered British Chinese … during the end of Qing Dynasty & Republican era, Baba & Nyonya consider themselves British Chinese that is why they usually dont mix with the new group of Chinese who arrived … besides that further on to the the 1920s to 1950s, many Chinese studied in English missionary schools and that created a group of Chinese who do not know how to speak or write English, they usually learn Chinese by their own effort and mainly because of Shaw Brother and TVB Dramas … these group of Chinese are called “Bananas” … yellow outside & white inside. at the same time, there are also schools that use Mandarin as the medium of instruction (in the olden times dialect) … so this group of Chinese will mainly speak Mandarin or Dialect to each other … but English & Malay is a compulsory exam paper in Malaysia so everyone will need to learn these 2 languages. So generally, Malaysian Chinese can speak all Chinese, English & Malay (Bahasa Malaysia) … but we seldom communicate in Bahasa Malaysia with one another Malaysian Chinese … even in the city areas such as Kuala Lumpur, we communicate with other ethnic groups Malay & Indians in English … because Rnglish is the primary language for corporate company matters … Bahasa Malaysia is mainly used in schools and official matters, as well as casual conversations with other ethnic groups. by the way, Malay (Bahasa Malaysia) and Malay (Bahasa Indonesia) is very different … sometimes we dont even understand each other … even within Malaysia there are also many different Malay dialect such as Bahasa Kelantan, Bahsa Kedah etc … but in school we study standard Bahasa Malaysia … there are also many types of Bahasa Indonesia – Bahasa Jawa, Bahasa Minangkabau, Bahasa Bali etc that is not understandable by one another. Hence, Baba & Nyonya culture and Malaysian Chinese culture are very different … although Baba & Nyonya are classified as Malaysian Chinese by law, but some of them are also classified as Bumiputra which has special rights as compared to normal Malaysian Chinese because they have been here for a longer time … Baba & Nyonya are the ones who usually communicate in Malay with one another … not Malaysian Chinese … but nowadays, most Baba & Nyonya and Malaysian Chinese assimilated and generally speak English or Chinese … and the Malaysian Chinese nowadays have also assimilated with Baba & Nyonya culture in terms of cooking preparing food like Nyonya Kuih (sweet bites) and Nyonya Curry. Most people outside of Malaysia thinks that Baba & Nyonya and Malaysian Chinese are the same … and that is where the confusion arise such as in tvb dramas that malaysian chinese speak to each other in bahasa malaysia. I think that while what you said is right in a way, you are also too sensitive. I find the sceneries shown are positive, the Malay portrayed are just HK, and foreigner’s perception of how Malaysia is. You are absolutely wrong in this, so you being from KL only forms 30%??? Come on, be realistic. BTW, those who are shown to harass Aimee are not gwailo, nor Indians. I rewind and see again and agin, they look more of Arabs and one white look more East European, like muslim Bosnian. And yes, we detest the influx of there muslims foreigners, but thats’ another story. hi missy, there are quite a high number of foreigners in KL what =P… around bukit bintang, myanmar people are staying in majority of the shophouses in pudu and imbi … in other areas in the sub city, there are also about 4 bangladeshi & indonesian workers to 2 malaysian workers in shops … construction workers are mainly indonesian or bangladeshi … mamak shops are also almost fully foreign workers … chinese restaurants also employ alot of myanmar workers … supermarkets also employ many myanmar, bangladesh and nepalese workers … cafes also employ myanmar and nepalese workers … dhoby also employ indian workers … even big corporate companies employ indians from india as consultants and programmers. but honestly everyday i say “hi” to a ratio of 70% foreigner to 30% malaysian in the bangsar area … this does not include the kwailos, japanese, korean and china chinese in the area who are also foreigners. of course in areas like petaling jaya, damansara and bandar utama this is less of an occurrence … but indeed, foreigners are quite a high proportion. I am Malaysian. Come on, be a sport, not a detailed expert. TVB is just trying to highlight and help promote Malaysia as a tourist destination by showing the landmarks, hence from Penang to KLCC twin towers. Geography aside, it is positive. Like you can show HK and Macao in one scene. It will spoil the story if you scripted that Aimee and Ruco have to fly here and there to meet up. It is all done in fun and light heartedness. This is different from other shows. Others show places as backdrop. This one is a tour group and is specific and named the places specifically. You may not mind much but I do. Penang has lots of its own places. No harm in adding that they will be travelling to kl for one day trip. Geographical integrity is important for this series because this is about a specific group. Tour group. If the audience wants correct information they will look it up on the Internet or watch a legit traveling documentary, NOT watch a TVB drama. Yes, but not KLCC twin towers. That deserves to be seen and shown. AND noted that it is IN KL and not as suggested in Penang. Sorry but I do not like how things are not properly introduced because they’re portraying tour groups and not 2 lovers galavanting with background as background. It needs to be SHOWN and needs to be INTRODUCED. Go to Internet to check? Some don’t and even if they do, so? Does it mean TVB can be lazy? Yes there is. Why would Ruco a penang guy just causally drop by at KL? It doesn’t make sense. But that was the only geographical integrity because after that there was no difference. His catchy phrase, leceh, doesn’t really am usual word being used here. At least not in Kuala Lumpur people :p.
Wondering what is the Sik Sik photo in the tablet ? Did Prince Luk from Hong Kong? Understand how they are trying to promote, trying to be part of it but we obviously could tell it’s just too fake. Giving up on the series !!! Is a flop !! Being an ex Malaysian, I am simply appalled at how Malaysia is portrayed and the people and the slang. All too obnoxious !!! Gives it a thumbs down !! You ex-malaysian? You have abandoned the country, yet still feel offended?? I thought you would have clapped, knowing that is why you leave in the first place, no meh? I agree some parts are not portrayed well, but they are realistic. The indian man who sell by the roadside on his motorbike and ‘no speak English’ when Aimee was lost and asked for directions and the bus driver who ‘no speak English’ is also correct. Wrong. They do speak basic eng and even if they don’t at least show them as helpful. Ep 1 is terrible in that aspect. Wrong. They don’t speak English. You never been lost before and tried to ask roadside peddlars for directions, have you? Yes, they are not helpful and that could be a misnomer, but they are not rude, just not wanting to help. Have you not seen sales staff at dept stores ‘running away’ when a caucasian woman went to ask them a question in English? I have, and these sales staff are not highly educated, otherwise they won’t be working as sales girl. Same with fast food, some speak Malay to you, not English though you place your orders in English. I disagree as well. Most Malaysian are well verse in multi language. And for direction thing, it really depends. Missy I am not talking about full sentence in English or proper grammar. I am talking about basic English and if you speak to someone in English and they see you’re not local they will reply in English eventhough broken English, whether sales girl or doctors. And even if someone is not highly educated they do know their lefts and their rights. Unless you’re talking small town. Penang and KL they’re not small town. Those people you see could have been from Myanmar or other countries. There are many foreigners in the food industry. The people I see, even the roadside stall owners know very basic english. The art is not to ask “May I have a can of Pepsi with ice please?” but ask “Pepsi one, ice”. They will understand unless they’re not local or they’re very young or very old. HK is different. They don’t speak English everyday. Malaysia English is practically 2nd national language. In business it is all English. In courts, English as well. Again I don’t mean proper grammatically correct full sentences in English. I stress, basic English. Funn, I see you as a privilege class to insist that all Malaysians understand English, because they don’t. You may be working in the publishing industry, sn English publication so most people you meet has english knowledge, and you may have never gotten lost before. You try to walk into a police station and speak English to the mata mata or to a government dept and speak English. The already ‘unfriendliness’ may become rude. You can continue to use english in all places, that will only get you a wider communication gap. And the last sentense “In courts, English as well’, is the greatest misnomer and error you made. All courts speak Bahasa (Malay). You have never been to a court before, have you? Lord, the irony of this question. Funn have been in more courts that most of us. I don’t know why some people insist on the image of Malaysia as dome backward country bumpkin of a society. I can’t speak for the smaller towns but major towns like kl and Penang most knows at least basic English. As for courts bm is used mot because they don’t know eng but because bm is required. And I am not in the publishing business. I repeat I am talking abt major towns and local folks. Which what makes Malaysia an easier destination for foreigners. Maybe you are from small towns or surround yourself with certain communities in certain locales hence your impression. Widen your circle or speak in eng to give them no choice but to answer in eng. and I repeat I am talking about broken eng. our civil servants can manage that. @Missy I don’t think you’ve stayed in Penang before. FYI, majority of the hawkers (non-foreign workers) and even the Indians selling kaya bread & junk food in motorbikes can speak English or broken English. This is very true especially those who are from the older generation as most of them are English educated or English/Malay educated. Just to correct you on our local police forces or local gov , nowadays they are very friendly and helpful (no, I’m not working for either). They won’t be offended or be rude to you even if you speak English to them. Think you’re quite old dated on your info regarding this. Just to clarify, this statement of mine is true for Penang, Perak, Selangor and Johor as I’ve personal experience with them both the polices and gov departments. got to agree that the geographical error, from Penang to KL.. im pretty sure Penang got a lot of places to promote as well or they should start and end everything in KL..
and Ruco Malay is not bad, but thats not how Malaysian Chinese speak 🙂 as what Funn mentioned, normally we will add some english, malay, cantonese in the sentence and not entirely malay only sentence..
quote “How much misconception, insults, geographical error and the likes must this series hurl at Malaysia before things are done the right way? Nothing wrong to me, no major misconceptions, or insults or overly negative portrayals. When they show the poor run-down places in Mongkok and delapidated building while chasing thugs in HK, and drivers scolding pedestrains when they cross the road the wrong way, are there a negative portrayal? I find Vivian’s acting is stiff and no improvement since she joined TVB, other than her Cantonese has improved tremendously. No offense to Malaysian readers here but i find the acting by the entire Malaysian cast really horrendous. I cringe at every scene that they appear in; their acting is worse than those kids in high school plays. You missed my point. And Vivienne is elegant. I did not say she was superb but she was competent and did her role well. as for Malaysian cash some may be djs. Hence the acting.but the Gwalior was bad too. Aimee was also bad too. Those Malaysian cast are extras. No acting experience. Zip, zero. they are not even categorised as cast. They are not lifted from drama artistes. Ruco’s the one holding up the series so far. Every scene of his is enjoyable and when he speaks Malay, he’s so hilarious and loveable. His broken Malay is understandable as he’s supposed to be from HK but went to Malaysia to escape his unhappy past. The fact that he spoke fully in Malay is not believable. It’s the frequency of the usage. TVB should have given him like a Malay BFF which explains his frequency. I suspect HK and ran to Malaysia for many years and immerse himself in Malaysian culture. Seriously? They wanna promote Malaysia also not like that la….come on, I was blown out of my brain when I suddenly saw Batu Caves after they left the hotel in Penang, LOL! I was like, wtf??!! My issue is not with famous attractions as backdrop., My issue is they’re depicting tour group and there is no geographical integrity and giving wrong impression. In Malaysia, the Malaysian chinese seldom speak bahasa malaysia…….. True but I have a few Chinese friends who speaks better BM than some Malays! Has Aimee’s acting improved here from previous dramas? Of course but she just doesn’t suit the character, in part I suppose acting is still improving as opposed to improved. After reading these reviews, I am wondering if TVB are just interested in promoting the best parts that they can in order to create a certain atmosphere. It’s clear they aren’t interested in proper geography. Background buildings, beaches, etc are sometimes required for setting a certain mood or to dramatically enhance a scene. They do this a lot in hollywood movies, but it seems worse in this show since it was suppose to be a tourism promotion it sounds like. That’s why it seems much worse. I’m sure its very frustrating for Malaysians to see their country portrayed in such a way. I am sure I would be a bit insulted if some show had NY and LA a short car ride away from each other. It is a huge turn off in something that is suppose to be based in reality. I doubt they are trying to harm tourism. They may be Totally Very Bad, but not evil. The funniest moment in this episode has to be when Sik Sik was fantasising abt what her knight in shiny armor looked like and lo and behold……..we see Moses’ face lol! I actually found the addition of Malay into the script a bit unnecessary, especially when it is obvious that Ruco’s character speaks perfectly good Cantonese as does Aimee’s character, and they can communicate perfectly well in Cantonese. I understand promo gimmicks, but it gets boring and cheesy after a while and it actually makes Ruco sound really awkward and gets in the way of script flow. If promoting Malaysia is the purpose, then make a travel show and have Ruco and Aimee host it. Or do some Amazing Race copycat show. At the very least, it would be something different and hopefully it would be more fun and more informative. Actually I’m more interested in Lin Xin Wei’s love story with Tony. Ruco and Aimee’s love story is just too boring. Bus should be slow hence 7 hours max but have seen bus faster than merc. Someone told me 1 hour. 1 hour?! How? Super sonic engine? Is this drama any good overall? Do you think it’s worth watching? Still too early to say for sure but right now, unless you’re a fan of any of the stars in this series, you can skip. what’s the name of the original soundtrack? 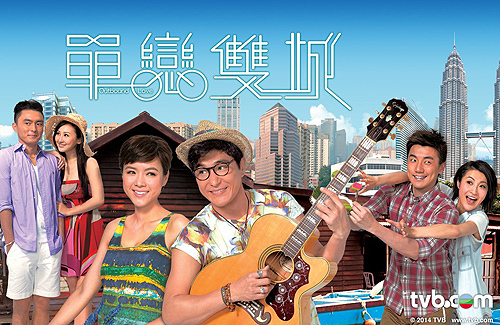 Aimee Chan got me into watching this series, and I enjoy watching Ruco Chan too. As a Malaysian-Chinese, I enjoy the series as it heavily features scenes from Malaysia, but it has so many inconsistencies with our culture LOL. If they want to portray Malaysians, at least do it right. However, the blame is not on the performers, but rather the filming crew. It shows that they have not done enough research on Malaysian culture, did not hire a Malaysian guide who is good enough or totally don’t care whatsoever. 1. Pavilion shopping mall is NOT below Sky Bar. It’s a 1.2km/16 minutes walk from Sky Bar to Pavilion mall. And yes, it’s at least 3 hours drive from Penang (Lassie hotel?) to Batu Caves, the Petronas Twin Towers or Pavilion, all of which are in Kuala Lumpur (more than 300km away from Penang). Anyway, the ‘inconsistent’ location is not really important, as most movies do that. 2. Cantonese language is influential among Malaysian-Chinese, but it is not the major dialect among Malaysian-Chinese. The largest Chinese community is the Hokkien-speaking Malaysian-Chinese, and mostly Mandarin for the rest. Cantonese is only widely spoken in Kuala Lumpur, Klang Valley (greater part of Kuala Lumpur), most districts in Perak state especially Ipoh, and Sandakan in Sabah state. In Penang, Hokkien is the common dialect among the Chinese, not Cantonese. Thus, Ruco should actually speak some Hokkien to match the culture. If you ask me, Sandakan-Cantonese is the closest to HK-Cantonese, as I have Sandakan friends. They refer to milk tea as ‘nai cha’, whereas KL-Cantonese is usually just ‘teh’. There are other examples but I’m lazy to write. Most people in Penang (yes even bus drivers and street hawkers) can converse in basic English as Penang is a tourist hotspot. So it’s not really so ‘freaky’ if you do not speak Malay when you come to Malaysia, especially in Penang and KL. Most of Malaysians can speak English, in fact, Malaysia has the highest English language proficiency level in the entire Asian region, according to a latest research by Swiss-based international education company EF Education First (EF) (the research excluded Philippines). 3. ‘Mou’ is used too often, and too deliberately to the extent that it’s out of context. And ‘leceh’??? I don’t recall anyone I know of that uses that word, although we all know the meaning of the word. We use ‘ma fan’. 4. HK people acting as Malaysians and Malaysians acting as HK tourists?? LOL really? 5. We don’t really call Nyonya as ‘leong yeh’, we just call Nyonya. 6. It’s extremely rare that Malaysian-Chinese will talk to each other in Malay. We only speak Malay when conversing with Malay or Indian people or with the government officers. 7. I’m not from Penang, but I know Penang people. They are friendly people! Not those who will knock you down at the airport or just scooted away without giving you directions! Meanwhile I just want to say, despite all the inconsistencies, this is a comedy and it’s meant to be light-hearted. Take it easy people, no need to argue over it! Happy Chinese New Year! Oh and I don’t believe that Aimee got ‘minta maaf’ wrongly pronounced! Aimee is talented in language (as she can speak French) so the problem is with the teacher! The theme song… not suitable for this drama. The casts age group is probably 25-35 but the song seriously sounds 12-18! Come on TVB, I know you want to make it romantic, but at least adult-romance, not teenage-romance. Duh! and the ringtone is annoying! So hard sell!